You should be able to find cactus with the needles removed, but if you don’t, you can ask nicely at the store to clean them for you. Or, you swiftly remove the needles by scraping them with a knife. Watch those prickles, they're small and annoying when they get inside your skin! In a mixing bowl, coat your cactus paddles evenly with half of the olive oil and season with salt and pepper. Throw on the grill to get some nice char marks and dilute some of the cactus mucilage. Remove and allow to cool. Meanwhile, in a bowl, add the remaining olive oil, lime zest, lime juice, 1/2 cup of blue berries, 3 tablespoons salt, oregano, and cilantro whisk until evenly incorporated to make the dressing. Reserve. Cut cactus into manageable strips, and coat with remaining salt, about a cup or so - heavily salted - and place on a strainer to allow the salt to extract the remaining mucilage - I like to let it sit for at least 30 minutes. Take the cactus and rinse under cold water to remove all the excess salt and place into a large mixing bowl. Add to the bowl the remaining blue berries, red onion, and dressing - toss freely. 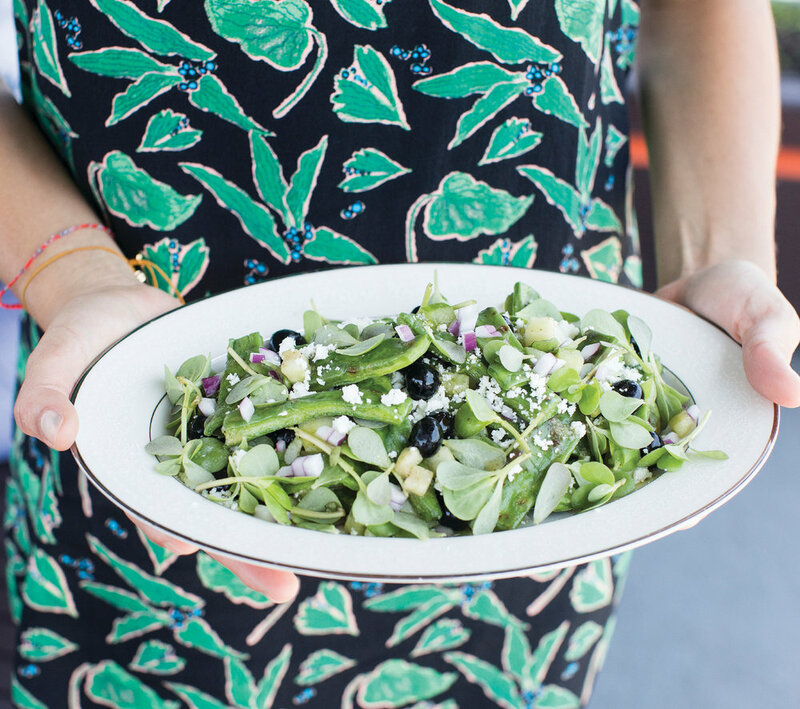 Garnish with queso fresco crumbs and purslane vines.